# full listing of individual contributors. # 02110-1301 USA, or see the FSF site: http://www.fsf.org. which can be used to plug in another evaluation engine. By default the Content Based router uses JBossRules. Read on to find how to bring up CBR, how to give it a specific rule set, and how to send a message to the CBR. category: The category of this service, which will be used at registration time. name: The name of this service, which will be at registration time. Note that both the service-category and service-name are needed to get a handle to this service. description: An optional element to describe what this service does. This description is supposed to be human readable. service-class: The class name of the actual listener. ruleSet: The set of rules that should be used to evaluate the content. Only 1 ruleSet can be given for each CBR. Just define more router if you need composite CBR routing. ruleLanguage: In JBossRules you can define a custom (business) language. This (optional) field can be used to pass in that custom language to go with the defined ruleSet. 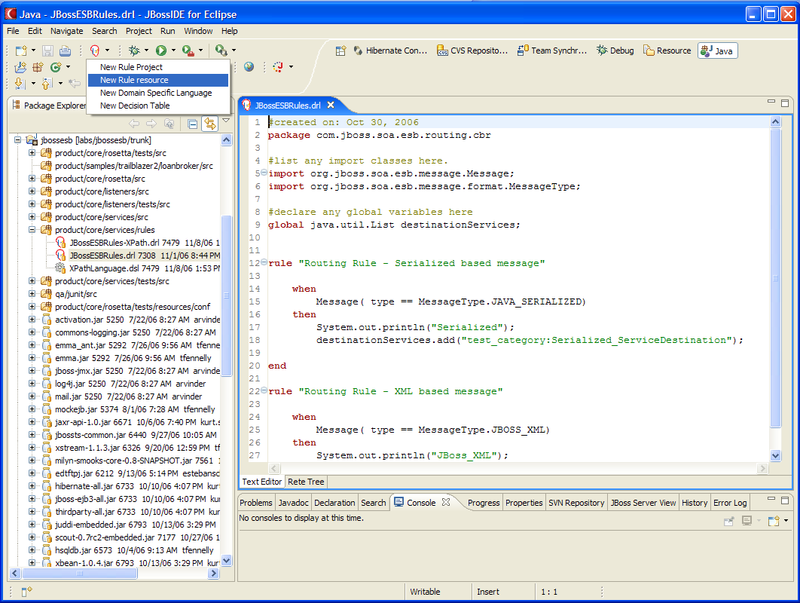 A rule set can be created using the JBossIDE which includes a plug-in for JbossRules. Figure 1 shows a screen shot the plug-in. Figure 1. JBoss Rules IDE. Create a new ruleSet. If you save your rule into the product/core/services/rules package it will be jarred up into the jbossesb-rules.jar. However as long as you your rules on the classpath somewhere JBossRules should find it. xpathMatch “<element>”: yields true if is an element by this name is matched. xpathEquals “<element>”, “<value>”): yields true if the element is found and it's value equals the value. You can define your own Custom Rule Language. class: the name of the action class. routeAndDeliver: route and deliver the message to the destination(s). route: route the message and return a message with a list of destinations attached to it. The separation of route and deliver allows for other actions (like message transformation) to be inserted between routing and delivering.